Last night my family celebrated Epiphany a little early with a simple but hearty supper of soup, bread, and apple tart, followed by a vigorous game of Clue. I’ve written before about my love of Epiphany. The quiet final day of Christmas, it celebrates light, hope, and winter magic. You could make much fancier desserts than this one for Epiphany. Last year I shared TWO recipes for Galette des Rois, one for chefs and one for klutzes—and the previous year I posted a gaudy Mardi Gras version of King Cake. 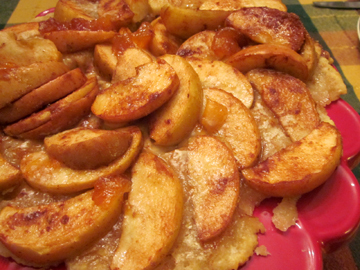 This scaled down version of a galette is delicious and ever so easy. A rustic tart, in case you hadn’t guessed, is one that looks really, really homemade—my personal specialty. This recipe is adapted from Mark Bittman, the king of simple and sweet. If you want the recipe for the soup we served with the tart, please consider buying my book about my mother, Pulling Taffy. Happy Epiphany! In a cold bowl combine the flour, 4 tablespoons sugar, and salt. Carefully cut in the butter, making sure not to mix it in too finely. Whisk together the egg yolk and 3 tablespoons of the water. Use a fork to stir them into the butter mixture. Add a little more cold water as needed to make the dough capable of forming into a ball (but barely). Wrap the ball of dough in wax paper and refrigerate it for at least 1 hour. At the end of the hour, preheat the oven to 400 degrees. Pat the dough into a circle about 10 inches in diameter (the rougher looking the better; remember; we’re being “rustique” here) on a nonstick cookie pan with edges that come up at the sides (so nothing can spill into your oven). Toss the apple pieces into the cinnamon and remaining sugar. Arrange the tossed apple pieces on your crust. If desired, heat the jam and drizzle it over the apples Dot with butter. Bake until the crust browns nicely (it’s best a little crispy), about 20 to 30 minutes. This entry was posted on Thursday, January 6th, 2011 at 9:22 am	and is filed under Apples and Cider, Cakes, Pies, and Pastry, Holiday Foods. You can follow any responses to this entry through the RSS 2.0 feed. You can leave a response, or trackback from your own site. Please stop all this temptation – I have to get into shape by the start of May for our holiday in Majorca …. I have to retrieve my swimsuit body from somewhere underneath the layer of fat that has crept on recently!! Mine is still up… til the weekend..but, then…I guess….it’s time….sigh…. I’m still baking eggnog loaves to use up the leftover ‘nog… and… well, also because when I want some in July… I can break out a lovely loaf to have with tea. I love Epiphany too, and it is the day I always take down the tree. Now real life begins again. I love your rustic apple tart too. I always think fruit desserts don’t count as decadent. How can fruit in any form be unhealthy? I take some time from the internet for a couple of weeks only to return to discover I might not be able to spend as much time as usual in one of my favorite kitchens. It’s cozy here, Tinky. But I plan to follow Pulling Taffy, so I’m also looking forward to that. I love the sound of this recipe. Did I ever send you my plum tart recipe? It probably has 4 or 5 ingredients, and is what I want to eat when the world isn’t treating me as I think it should!! I think I have all the ingredients for your tart – especially the cinnamon! Another great posting. This recipe sounds really good. How fun that you will have some recipes on your other blog! I will have to go and check it out. We took down decorations at the Pots Place and slowly are putting them away. It was fun while it lasted. Sorry, Frayed, but at least it’s a relatively small tart. I love the sound of your egg-nog loaves, BumbleVee. And I know what you mean about saying goodbye to the tree. Commonweeder, you’re a woman after my own heart. Grad, I would adore the plum tart recipe And Elizabeth, make that fun last a little longer if you can! Yum! I love all things apple-pies, crisps, tarts…and when they’re rustic, I think they taste even better!